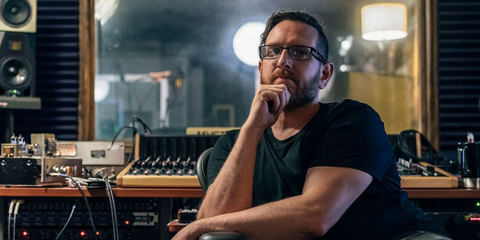 My name is Daniel Meuser and I’m a fully qualified audio engineer and sound designer from Mainz, Germany. I’m specialized in interactive audio, sound design for games, and field recording. The last project I was involved in was “Crytek’s Hunt: The Showdown”, which will be released as an early-access title somewhere around the first quarter of 2018. I’m currently working on a sample pack featuring the natural ambient sounds of quiet deciduous forests. This collection of natural ambiances is called “Herbstwald”, which means autumn forest. It was recorded between late fall and winter 2017 in various wooded and forested areas all over Germany. I was lucky enough to be able to use a brand new LCT 540 S from LEWITT for this project. So I’ve tested it extensively out in the field, and I’ve been deeply impressed by this microphone’s sound quality and sturdiness! When you think about LEWITT, you might think of high quality microphones made in Austria used for the best chamber music and orchestral recordings. And this particular microphone has been advertised as a superb vocal mic. Although I’m pretty sure that’s all perfectly true, I want to try and shift your perspective a bit on this and show how I use it in my work as a sound designer in cool projects, where audio is for the most part used in an interactive way. Two things are important to me here. First of all, I want to stress that a microphone’s place doesn’t have to be in the studio or in traditional uses like in a musical recording. The soundtrack of mother earth is really beautiful and fascinating, too, and well worth the effort of recording it. Talking about field recording is talking about the appreciation of sound itself in the first place. 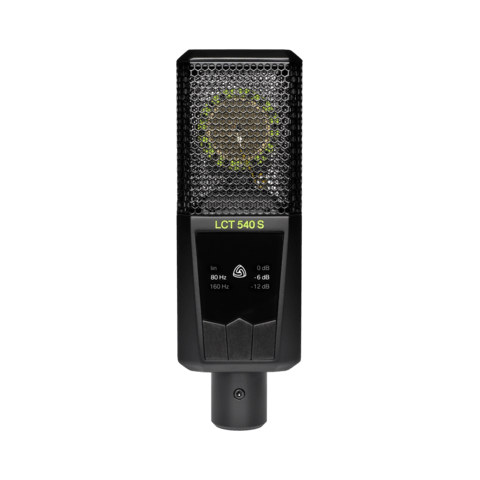 And to be able to capture it in every detail with a microphone like the LCT 540 S is an experience that will redefine your sense of hearing and help you hear the world in a completely different way. It’s literately better than your ears! I hope that my recording diary can serve you as an introduction into the art of field recording, which is part of my work as sound designer, and I’d like to encourage everyone to go out and try it for themselves. Secondly, having making the bold statement that you can and should use this microphone outdoors, I’ll be describing how and in what scenarios I’ve been testing it and what my conclusions are. Some might think that you shouldn’t use a large-diaphragm “studio” microphone for field recordings at all. And yes, large-capsule condensers are generally much more sensitive to weather conditions, humidity, and temperature. But I was intrigued by the military-grade build quality and fantastic specs like the extremely low self-noise that’s underneath the threshold of human hearing throughout the entire frequency spectrum, as well as the high dynamic range that would make this microphone the perfect tool to capture quiet ambient sounds and really anything from subtle whispering to super loud SFX’s. Plus, it’s got a lot of versatility with its flexible low-cut filters at 80 and 160 Hz, which can help with things like excessive wind rumble, as well as the two-stage pad filter that increases the impressive max SPL of 136 dB (A) by another 6 or 12 dB for recording extremely loud events like thunderstorms, etc. So to summarize: the low self-noise, linear frequency response, high dynamic range and signal to noise ratio, cardioid pattern, and the low-cut settings, as well as the pad filters, make this microphone super-versatile and a true all-rounder with very special, distinctive features! The exceptional specs were reason enough for me to give it a shot and test it with the three different recording scenarios I needed to take care of for this project, and these are also a good example with which to describe the day-to-day recording tasks I encounter in my sound design work. But before going out, I did a rather unconventional “test” at home that I also did with all my other mics the day the LCT 540 S arrived. I took a hot shower until the bathroom filled up with water vapor to simulate extreme air humidity at high temperatures and how the condensation process influences the mic’s performance while recording for a prolonged period (about an hour). To my surprise, I could not perceive any audible artifacts due to moisture-related self-polarization of the capsule. I was thrilled by that outcome and got pretty euphoric about the real-world outdoor test, which would be a lot tougher since microphone capsules tend to have a much harder time dealing with condensation at lower temperatures, like around 0 C° (+/- 5 C°). The first task was to record clean, natural ambiances that can be used as the acoustic backbone of a scene in a motion picture project or in a virtual game world. This is the perfect test scenario because it involves long recordings of up to 2–3 hours’ length in a humid and cold climate. And since we’re talking about climate and location, there are a few planning basics to remember before going out to a field recording trip. When you do this kind of work, it’s extremely important to choose a silent location without excessive traffic noise or city rumble. The next big problem is aircraft noise. There’s basically no escaping this in high-traffic areas – like more or less all over Europe; the only thing you can do is use an air traffic app and be really patient and plan for a lot of production time. Apart from this, it’s also very important to take a look at the weather forecast. You don’t want to get caught out in the middle of a rainstorm with your expensive gear! Rain and wind can act as white noise generators, making it impossible to get a clean background recording. So that means: unless you specifically want to record these phenomena, you need to wait until the weather calms down and events in the background are much more clearly noticeable and thus recordable. There are also a few things that describe the attributes of the ambiances to be recorded for a project, and these help to define the distinctiveness of the recorded material in order to fit the project’s concept. When you record ambiances in fall/winter, where the forest is going dormant, birdsong isn’t as prominent and vivid as in spring … but they sound more experienced and can step up to the foreground like a solo in an opera. In September, all the leaves are still on the trees and the forest still has those nice acoustics where you can perceive the natural echoes of nature’s own cathedrals. But gradually, as you move toward December, all the leaves fall – which opens up the natural ceiling and changes the forest’s acoustics to sound more similar to an open field. These ambiances will be a lot quieter, with the main actors being elements like rain or wind. They’re more reduced to the basic elements, and that’s somehow the beauty of it. So with all that said, it’s now time to briefly think about the different kinds of natural environments I might encounter. Obviously, I want to go deep into pine or beech woods as well as to more open woodlands with grassy meadows. But a wooded lakeside or swampy woods can also sound interesting. And there were two events in particular that were pretty high on my list of what I wanted to capture: the dawn/dusk bird chorus, especially of migrating cranes, and a rotting deer carcass. Other events I thought of capturing are the woodpeckers drumming on trees and working on their nests, interrupted by crows cawing in the distance or tree cracking in the wind. Now having said that, I need to say a bit about the technical realization of the recordings. The ambiances were recorded with up to three different recording rigs consisting of a small-diaphragm cardioid condenser ORTF array, a large-diaphragm cardioid condenser ORTF array, and a hi-sens miniature lavalier omni large AB array. And since it doesn’t make a lot of sense to record ambiances in mono, I needed to find a way to incorporate the LCT 540 S into one of these rigs. So I decided to use it as a center mic in conjunction with the small-diaphragm stereo ORTF array. The main reason why I originally got in touch with LEWITT was that I was looking for a way to replace my Rode NT1A’s, which are somewhat popular amongst field recordists; I’d started using them to record ambient sound because they had low self-noise and a high output level. But after using them a few times, I was a bit disappointed about how they turned out to be extremely sensitive to moisture and wind (despite the fact that I was using them inside a windshield). I fairly often had problems with moisture-related artifacts due to self-polarization of the capsule. 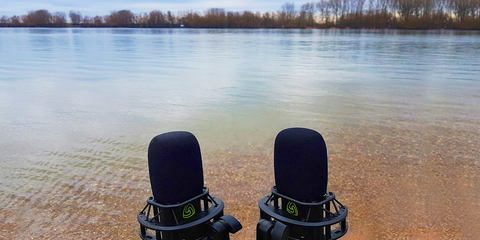 Unfortunately, they just weren’t reliable in humid, cold conditions, which can be really frustrating if you go on a field recording trip to special locations only to discover that your tools don’t perform reliably. They were okay in terms of sound quality, but I must admit that they’re no match for the LCT 540 S in terms of dynamic response and linearity. Especially in the low mids and high frequencies, the NT1A’s had problems that were quite audible: the signal seemed to be muddy with lack of definition and sounded a bit harsh. All this was sometimes quite tricky to EQ and would end up taking a lot of time in post. The LCT 540 S, on the other hand, has performed very well in humid and cold outdoor conditions. For some ambiances, I had to let the microphones record for two-to-three hours at around 5° C with 90% humidity. And since I hadn’t had any time to come up with a DIY windshield solution for the LCT 540 S, I had to use it just with the foam cover! And even so: not once did I run into moisture-related problems while doing these prolonged ambient recording sessions. I honestly hadn’t expected this mic to be that resilient to moisture. And when it comes to sound quality, the exceptional low self-noise and linear frequency response make this mic miles better than the NT1A. The sound image seems much clearer and more natural across the entire frequency spectrum without sounding thin, hyped, or peaked in certain areas. I really liked the dynamic response, too, which is surprisingly snappy for a large-diaphragm condenser; that enhances the impression of the sound being very natural and present. And remember: we’re taking here about recording sounds in the background, meaning out in the open where the sound sources are very far off. So don’t expect anything like proximity effect, etc. here. That’s a completely different subject. It is kind of weird, because it’s the cleanest mic with the lowest self-noise I actually use, but at the same time it doesn’t sound analytical like a measurement mic. It has that typical expensive studio mic sound that can be described as rich, natural, and smooth, with a nice high frequency definition that gives the recording presence and depth. So I must admit that Lewitt has done a hell of a job with this beautiful mic, and I’m happy to replace the NT1A’s with it anytime! In this clip, you can hear a small selection of “Herbstwald” ambiances in stereo. My next task was to record some single-sound sources to be used with single-entity props found in natural environments within the game. There are basically three major types of sounds to take into consideration. First of all, plant movement and plant materials – like acorns that fall to the ground and leaves rustling on the floor when the winds blow. Then there are all sorts of wildlife, which can be particularly difficult to record. And finally, local environmental events caused by the elements like stones falling from a cliff, wind howling at the mouth of a cave, and all sorts of sounds created by running water. Sometimes you encounter small trickles, creeks, or even rivers that are part of the landscape and can be recorded close-up, for ease of use in placing them manually as a 3D-sound source on a river object inside the virtual world. So on this day, I went out to record an interesting object belonging to that category: a small woodland creek in the Palatinate Forest (Pfälzerwald) that cuts through a natural valley known as the Karlstal. The weather conditions were pretty calm with wind speeds of approx. 5–10 km/h, a temperature of 6–8 C°, and around 90% humidity. When it comes to single-source recordings, location, perspective, and distance are the key decisions to be made. 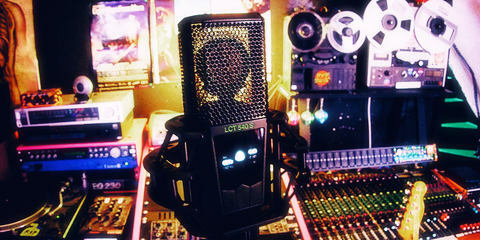 Individual props can be recorded in mono or stereo, again depending on the project. So I stuck with the center + ORTF array already mentioned above. Perspective-wise, I went with three basic distances for the creek. Close-up, meaning max. 0.5 meters away from the source, a medium distance of around 1.5–2 meters away, and a bit farther off at around 4–5 meters in order to have enough flexibility to match the audio assets to the visual context later on inside the game. 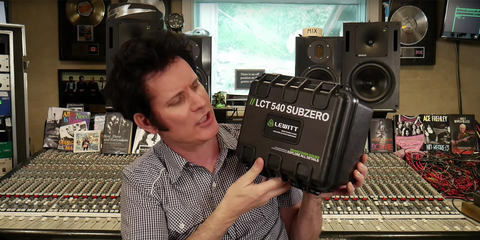 The big question now is: How did the LCT 540 S perform? Well first of all, pretty amazing. Again there were no issues whatsoever due to humidity or low temperatures. It never failed me despite the fact that I used it all day. The other thing I liked was, once again, the sound quality. Especially when you place it a few meters away from the source, you immediately notice how great it is to use a mic with super-low self-noise that gives you that natural clear image with exceptional dynamic response. On the first clip, you’ll hear recordings of the creek that demonstrate the different perspectives: far off, medium-distance, and close-in mono. The final task I had to accomplish was to record footsteps. Sounds easy, right? Well, it’s actually not. There are a few things to consider if you want to plan to use recorded footsteps for game development. First, you need to know how you want to use the sounds, and second, you need to know how to realize them. I think everyone who’s ever played a video game knows roughly how footstep sounds work. 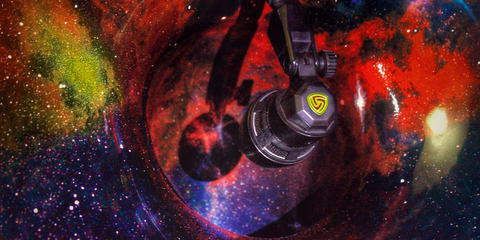 It’s a feedback sound for the game’s mechanical “movement.” There are two main ways to realize these kinds of sounds. They can be traditional, player-oriented stereo sounds, or they can be spatialized 3D sounds depending on the respective bone structures of the characters. In 2D games, it’s more common to use stereo sounds, and in 3D games, it’s much more likely for these sounds to be implemented as 3D sounds. But there are no rigid rules here. In any case, this has a direct influence on the micing technique. Spatialization only works with mono recordings or at least mono-compatible assets. Ideally, you want to record such things as close and as dry as possible, because they represent the sound of the respective material. Therefore, background noise needs to be avoided as much as possible – which can be difficult outdoors. One thing I did was use a M/S Shotgun or the LCT 540 S on a boom pole to place it as close as I could get, providing as much foreground/background separation as possible. This gave me 100% mono-compatible assets to be used as 3D sounds. 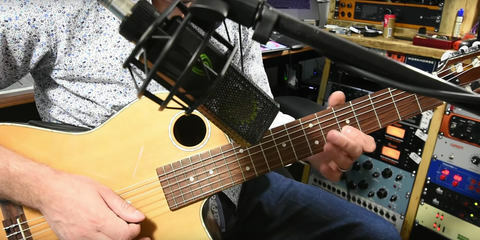 The second rig consisted of a small condenser stereo mic placed inside an ORTF blimp with a wide stereo image to be used as traditional player-oriented stereo sound. From my experience in game development, I knew that there’s a need for special surface footsteps like forest plain, gravel, or mud. Because normally, you’ll have a surface material on the different ground textures inside the virtual world that can be connected to the respective trigger of the audio assets. So when it comes to footstep sound effects, one of the challenges is to find sounds recorded on just the right representative surface. The good thing about these surface material sounds is that I wouldn’t need to record the sounds with multiple shoes, because it’s supposed to be mixed later on with the iconic character footstep sounds. On the other hand, I would be needing to record basic performances and articulations that are common in the player avatars’ movement – like crouching, walking, running, etc. This is important, because different kinds of motion have different sonic impacts on the ground materials, and you want to have the flexibility inside the engine to reflect that. Apart from that, it’s extremely important to choose the right location at the right time. Birdsong can be a huge problem here, so you need to think about recording at midday or even at night in order to avoid this as much as possible. Though since I did this recording work in late fall/winter, I didn’t have to struggle so much with this kind of environmental noise. We had some December snow here in Germany, so I took the opportunity to record snow and shallow-water footstep sounds on that day. I went out for several hours with the LCT 540 S on a boom pole and had no issues whatsoever. Once again, it was a solid performance. And I really liked the portability and the sound quality of that setup for this kind of recording. You get that rich, detailed sound and a super-close and dry recording, and it’s pretty much a run-and-gun setup for a one-man crew. I’d never gotten such good-sounding results in such a short amount of time. It really blew me away, and I do think that I’ve found my new favorite tool to record footstep and Foley sounds. So great job, LEWITT! I don’t know exactly how the engineering wizards managed to come up with such a super-quiet and extremely weather-resistant AF condenser circuit design, but after working with it in different scenarios, this microphone has quickly become a tool that – in so many different respects – I wouldn’t want to do without. It’s definitely something like a secret weapon for field recordists and sound designers, and I couldn’t recommend it more highly. These two clips demonstrate mixed snow and shallow water recordings done close-up in mono using a boom pole. Daniel Meuser is a graduated Sound Designer from Germany specialized in interactive and game audio. In his Bachelor Project, he developed as an early adaptor a 3D-Audio-Production pipeline for a VR-Experience for the Oculus Rift platform. In 2017 he started working in the game industry where he worked on Cryteks Hunt: The Showdown. He has also been involved in short films and feature films, be it providing evocative SFX, Atmo and Foley sounds, or even mix-downs for cinema and broadcast in Post-Pro. He has started to produce his own SFX libraries lately and written articles about his work. You may have heard of ASMR, the increasingly popular internet-based relaxation trend. 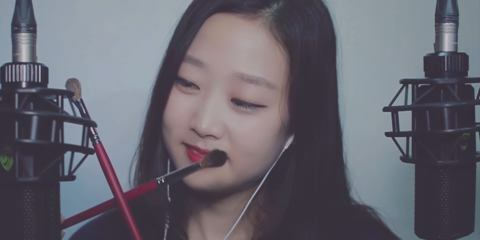 Dana Park is a South Korean creator of videos that purposely trigger ASMR, which is described as a pleasant, tingly sensation in the scalp that extends down the back and out through the limbs. She started her YouTube channel in 2013 and has currently over 500.000 subscribers.